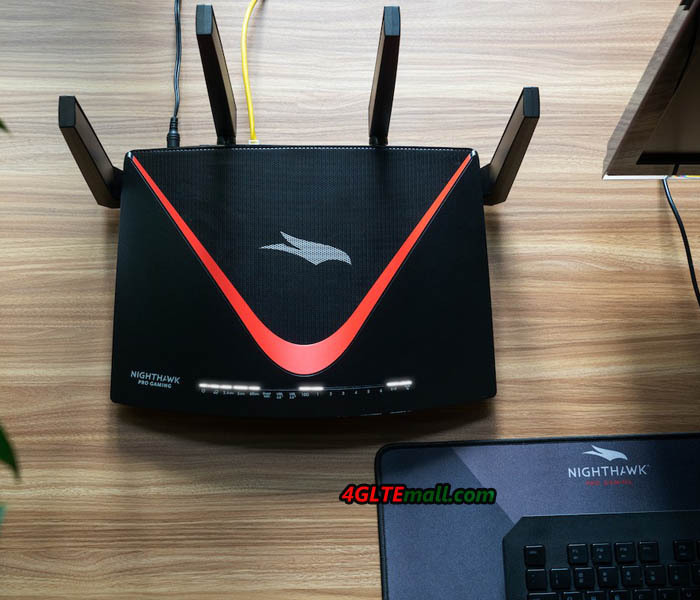 The Netgear Nighthawk XR700 gaming router delivers superlatives: huge body, spectacular design, many wireless antennas, and the latest wireless 802.11ad technology, in addition, an SFP connection for 10 Gigabit Ethernet. 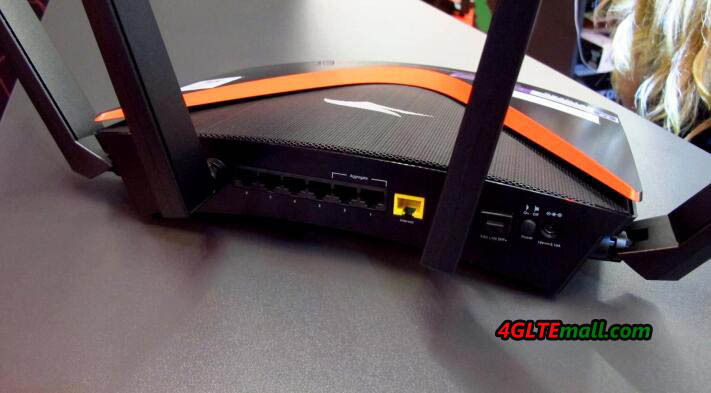 So it is clear: this Netgear XR700 router is not aimed at the classic standard user, but at users who want to have super fast connections and lots of power in the home network such as gamers. Netgear has gone all-in for the design and designed a very unique case. The XR700 gaming router is huge and heavy in comparison to other router models, especially the bulky wireless antennas catch the eye. A large ventilation grille on the front allows a view of the technology and the active fan, red stripes on the body provide a fresh look. Overall, the design takes a bit of getting used to and certainly not compatible with any home decor – the XR700 is more likely to fit between gaming computers and network switches rather than on the dresser in the entry hallway. The Netgear Nighthawk XR700 can use WLAN on three frequency ranges: 2.4 GHz, 5 GHz and 60 GHz. Over 2.4 GHz, a maximum of 400 Mbit/s is possible, over 5 GHz up to 1733 Mbit/s and over 60 GHz even up to 4,600 Mbit/s – in each case a suitably equipped terminal provided. 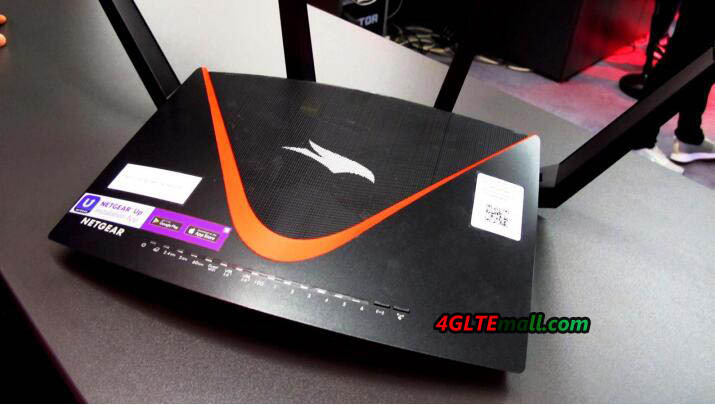 The router supports 4 × 4 MU-MIMO antenna technology and offers a comparatively good range. An apartment of 60-80 square meters can be easily provided without the further repeater. The integrated 802.11ad WLAN at 60 GHz is a curiosity. Theoretically, very high data rates are possible at a short distance – ideally a few meters and visual contact. Practically, however, it lacks of devices that have integrated 802.11ad. In fact, very few devices around the world are with this technology. Although there are retrofit solutions, including from Intel, but even Netgear has no retrofit adapter for USB or PCIe in the range. The 60 GHz WLAN could therefore not be tested. The Netgear XR700 has six RJ45 Gigabit LAN ports on the back, two more than an ordinary wireless router. Ports 1 and 2 can even be combined via Link Aggregation and thus significantly increase the speed, if supported by the end device (for example, a NAS). If you need an even faster LAN, you can buy a 10 GBit/s SFP module from a retailer and install it in the XR700’s SFP bay. Then up to 10 Gbit/s are possible. The Netgear XR700 has no integrated modem. This is a shame given the high price on the one hand, on the other hand, there are now with (V) DSL, TV cable and fiber- three common types of connection and so anyone can take the modem, which fits best. The modem is then connected to the XR700 via the 1 Gbps WAN port. For external devices such as hard drives or printers, there are two USB 3.0 ports on the Netgear XR700. In practice, a USB stick was easily detected and could be used within a short time. The data transfer rates were not tested in detail. One thing is clear: the Netgear Nighthawk XR700 is not a router for everyone. This is already visible at the incredibly high price. But when you get the Netgear XR700, you can get other things that are otherwise in hardly any other router: an extraordinary design, good workmanship, top wireless performance, an SFP port for 10 GBit LAN and good software. Due to the lack of end devices, the integrated WLAN 802.11ad can hardly be used by anyone – but it is, after all, integrated. If you want to combine this combination of high-end features in one router, the Netgear Nighthawk XR700 is just what you need.